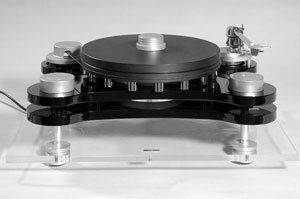 Bluenotes top of the line reference turntable, the Bellagio, features a stainless-steel-spring suspended chassis and sounds dynamic, detailed, focused and open. This superb performance is achieved by design, with its high and perfectly balanced mass, innovative decoupling system and the curved arm-board shapes; also the very fine quality of its bearing/spindle system. The 40mm platter is made of Black Sustanin polymer for controlling and dissipating vibration. Bluenote Bellagio owners manual, service manuals and schematics are for reference only and the Vinyl Engine bears no responsibility for errors or other inaccuracies. The PDF files are provided under strict licence. Reproduction without prior permission or for financial gain is strictly prohibited. This website is not affiliated with or sponsored by Bluenote.